Knud came through – on our last full day of paddling. He delivered not just an orange, but a full case of them. This was likely his attempt to make amends for all our toils of the previous weeks. For the first time, we had a glorious day of paddling. Calm, blue skies. Placid water reflecting the ice as it passed below our blades. For long stretches, flocks of guillemots led our way. These impish birds are the penguins of the north and a delightful distraction while paddling. We reached Carl Ritter bay in the early morning. I promptly prostrated myself on the beach thanking the spirits of Messrs, Rasmussen, and Ritter for providing this day and location. As I write this, I’m sitting on a field filled with Arctic poppies, fireweed and willow. Everything is still. It’s warm enough that I am wearing only a light shirt and pants after bathing in the stream that runs next to me. 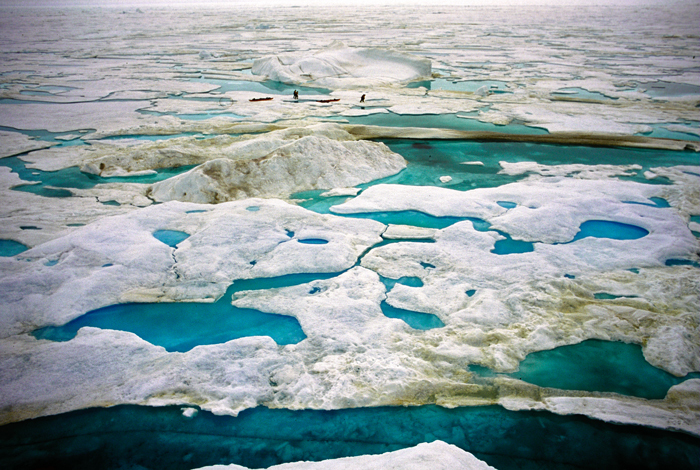 Before me is a collection of ice bergs and sea ice of every shape and size imaginable. They are sitting on a mirror-like expanse of water that reaches to Greenland looking like an outdoor art exhibition at the MoMA. I am savoring every drop. Last night we camped on the sea ice. From the door of the tent we can see Fort Conger in the distance–actually it is not that distant. It took us all day to get here. Yesterday was spent trying to fit everything into our kayaks. The end result, stuff tied on everywhere. By the time we got going it was 5:00PM, which seems a more fitting time for arriving. We hoped we could avoid harnessing ourselves up like donkeys to drag our loaded kayaks across the not-so-flat ice but after an hour or two we realized that we were not going to get too far paddling in the small space between the high and low tide. So here we are, with the ruins of Adolphus Greely’s camp in the distance. 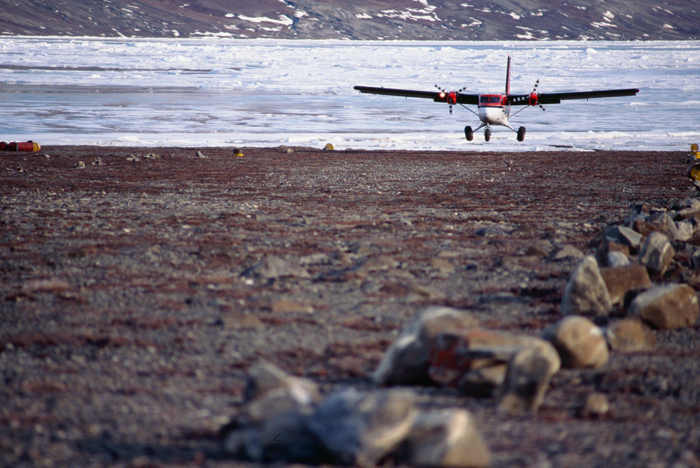 We arrived in Fort Conger late on July 2nd, flying low in the Twin Otter, only 1,500 feet above the ground. Our small plane was stuffed like a sausage with us, all of our gear, and three kayaks. Our pilots followed the narrow frozen passageways of the massive islands of the Canadian Archipelago. We feel so lucky to have arrived. Low clouds and fog have set in, and up here, pilots fly only by sight.